See video promo from Tate Publishing. But note the book is no longer available at Tate Publishing. See update below. The book consists of 345 pages, divided into four parts. Part I titled ‘Complexity’ deals with design in nature, in the universe, as well as information and the origin of life, which includes the unique designs of structures within living cells and important features of our earthly habitat on which life depends. Gibson ends that section with a discussion on the probability of life arising by chance. Part II titled ‘The Fossil Record’ includes discussion of stasis in living organisms when compared to discoveries of the same in the fossil record. The author also includes out-of-place fossils and out-of-place artifacts dug up from sedimentary layers. 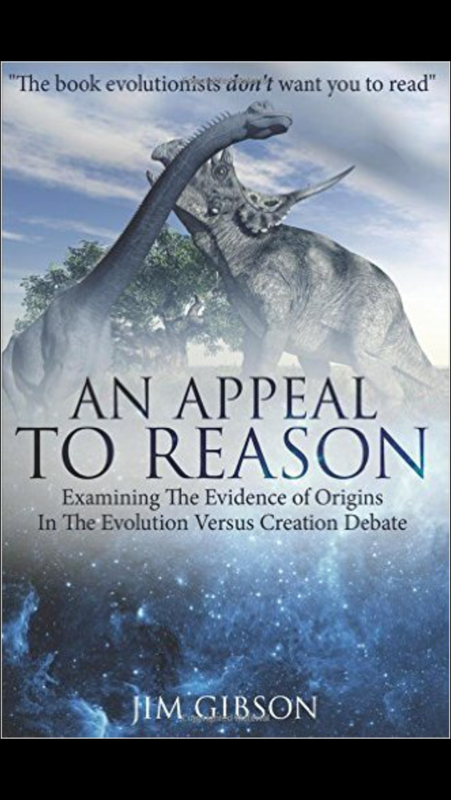 He shows the weaknesses of the alleged evolution of horses, birds and whales, including the scientific evidence that contradicts any plausible evolutionary account. He ends that section with fossil graveyards, which cannot be plausibly explained by uniformitarian methods but are far better explained by a universal deluge—Noah’s flood. Part III titled ‘Dinosaurs’ includes some interesting accounts (stories) from mostly the Congo of a knowledge of dinosaurian creatures. Artifact and petroglyph finds are discussed, which contradict the allegation that dinosaurs went extinct 65 million years ago. They indicate that man and some dinosaurs lived contemporaneously in the last thousand years. That evidence fits the biblical history that Noah took dinosaurs in the Ark and hence they were present on Earth in the post-Flood world. It is no wonder then that man battled and hunted and possibly exterminated most of them over the ensuing 4000 years. Part IV titled ‘Miscellaneous’ includes a range of subjects. These include radiometric dating, human evolution, a few problems with the standard big bang/inflationary cosmologies and what Gibson calls the ‘seeds of evolution’. These are the three major ‘isms’ of the last 200 years: communism, humanism and atheism. All three rely on godless evolution. The author discusses briefly three popular biblical compromises: theistic evolution, progressive creation and the gap theory. He ends with a reasonable defence of the traditional view, Young-Earth Creation (YEC). The book is not intended as a rigorous scientific text and some might consider that is its weakness. However the author includes 412 references, which can be pursued by the interested reader. One criticism I would make is that I do not like the use of a few terms. Gibson uses the term ‘creationism’. He means ‘biblical creation,’ which is the worldview that relies on the biblical account in Genesis as straightforward history. Thus it is not a philosophy made-up by humans. The author also uses ‘microevolution’ as compared with ‘macroevolution’. These terms create a misunderstanding in many readers’ minds. The reason is that the word evolution has two different meanings in the two expressions. Microevolution refers to the observed phenomenon of genetic speciation through natural selection, which includes mutations. That is operational science. But macroevolution refers to the unobserved changes which allegedly bought about all living species starting with ‘pond scum’ about 3.8 billion years ago. That is not operational but historical science. Macroevolution can never be achieved through microevolution because the changes in speciation processes can/will never add up to change microbes into microbiologists. The reason is that information would be needed to be added at every step and that is not observed with natural selection. Natural selection is limited to the existing genetic information, which exists within any genome. And invariably mutations are deleterious or at best neutral. No new information is added through mutations but gobs of new information are needed for macroevolution to have any basis in fact. Therefore evolution, as used in that sense, is a failed paradigm. I received the following email from the author. Tate Publishing has closed its doors due to fraud charges brought against its CEO. Amazon dealers only have a few of my books left and are charging a ridiculous fee. If any of your readers would like a copy, then I would have to mail it to them. I have a couple of hundred in stock. I would just charge $10 and that includes shipping (U.S.) only. All others would be charged $5 plus s/h. They can email me: jgibson1948@yahoo.com. So there you have it. Contact the author Jim Gibson if you want to get a copy of the book.